Big Data contains undeniable value but Hadoop's batch legacy limits its ability to make big data actionable for low latency enterprise analytics. Faster hardware and enterprise software to the rescue: EMC DSSD & Cloudera have collaborated to couple the world's fastest rack-scale flash array and the most popular open-source Hadoop distribution to redefine Hadoop for real-time and enterprise analytics. Simply dropping in faster media wasn't enough, though; our collaboration also involved building new capacities for Hadoop to take full advantage of flash performance speed and build a flexible architecture for next-generation, real-time applications. Highlight the core use cases for high performance big data analytics. Anand Bisen is Principal Solutions Architect at EMC DSSD and has been architecting large scale IO intensive computational environments for last 10 years. At EMC DSSD his focus is on developing solutions for Big Data & Advanced Analytics. Prior to joining DSSD Bisen was at SAS Institute. He was awarded MS in Computer Science in 2004 from from Purdue University where focus of his research was in High Performance Scientific Tools. Tony is one of the developers responsible for the DSSD integration with Cloudera's Distribution of Hadoop (CDH) and Cloudera Manager (CM). 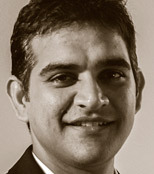 At Cloudera his focus is on integrating partner solutions with Cloudera software. Tony was awarded MS in Electrical Engineering in 2011 from University of Washington.